We Provide Deluxe Bus, Luxury Ac & Non Bus, Volvo Bus, Group tours, corporate bus, school/college trip, wedding bus at best price in Your City. 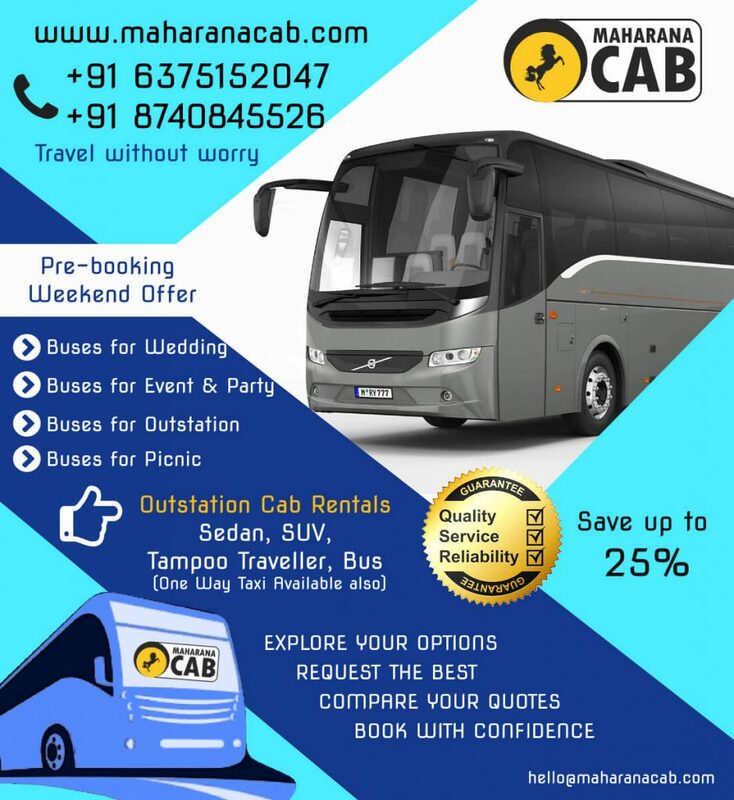 Maharana Cabs have Volvo buses AC/ Non AC bus rental in Jaipur. We are providing buses for many purposes. We also offer buses for the holiday packages so that you can enjoy with your whole family. According to your suitability and season we offer the AC or Non AC buses. Are you planning for a long tour? Or seeking for bus rental in jaipur for wedding guests, school and college trips? Maharana cabs is providing best bus rental in jaipur to meet your all requirements. We are providing bus rental services at the best prices. If you are traveling with the group of the 30 persons or less then we are providing you 30 seater Volvo bus. In the bus there have a separate cabin with the seats for the driver and the helper. Volvo and the Deluxe buses are considered to be one of the finest and the best option while travelling in the larger groups of the people. We take care of the quality by offering exceptionally high levels of the technical values, presentation and the total cost cutting measures, as well as comfort and safety. In the bus we provides the low interior noise level which helps to create a pleasurable environment. We take care of your comfort with the comfortable recliner seats having the push back seats for the Jaipur sightseeing, School/ College trips, for wedding guests and for many purposes. We would offer the 18 seated Ac Super Deluxe Bus to complete your trip for many purpose. You can book bus rental in jaipur to make your trips complete with maharana cabs. Hence you can book our services from anytime and from anywhere. Since 2012 we are providing the quality service. We provide a driver and bus attendant along with our bus, so you can enjoy your tour. Maharana Cabs provide AC & Non AC Bus Rental in Jaipur, Mercedes Benz Bus, Luxury Volvo Bus at best price in jaipur. We are providing 20 seated Ac deluxe bus, our service comes with state-of-the-art features offering total comfort and luxury. Competitive price, bus rental in jaipur offers value for money. Having a number of India-specific features, the bus has always been liked by Indian consumers. Our bus booking online services is not location specific. You can book our services online from anywhere and be assured for quality services. We provide a driver and bus attendant along with our bus, so you can enjoy your tour. We provide AC & Non AC Bus Rental in Jaipur, Mercedes Benz Bus, Luxury Volvo Bus at best price in your city.